Many people enjoy fishing because it’s relaxing. But for Kyle Stafford and Evan Wieber — and others like them — fishing is a competitive sport. Many people consider fishing a recreational past-time. When they fish, it’s a time to relax and commune with nature. Whether they catch any fish is immaterial. But for collegiate sportsmen Kyle Stafford and Evan Wieber, fishing is more of an art and science. “I love the thrill of being out there and never knowing if you’re going to win. One day you can win and another day you can be very humbled and not catch a fish,” says Evan Wieber, a Polk State College sophomore studying Business Management. 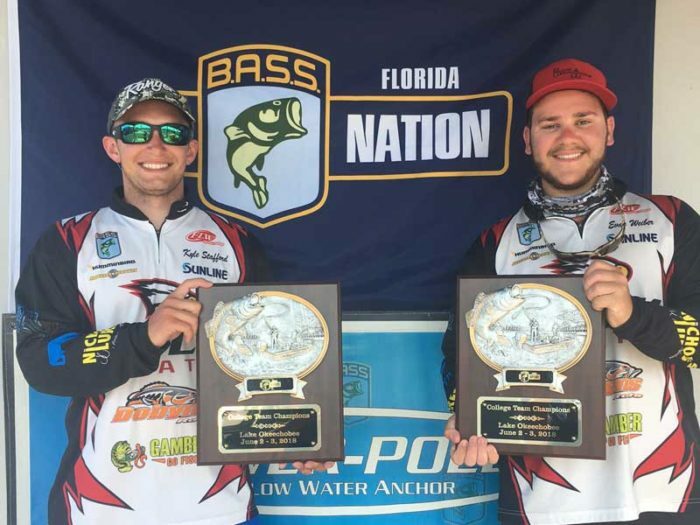 Stafford and Wieber fish competitively for Polk State College’s fishing team, known formally as the Bass Fishing Club. The pair was named Collegiate Team Champions in a Florida B.A.S.S. Nation competition, with a two-day total weight of 26.07 pounds, at Lake Okeechobee June 2-3. Two teams from the college, one of them including Stafford, will be representing it in Fishing League Worldwide’s 2019 YETI College Fishing Championship in May. When it comes to fishing competitively, practicing on the body of water where the competition will be held is part of the equation. Stafford usually sets aside a week beforehand to prepare. Stafford, president of the Bass Fishing Club, also studies the map and watches Youtube videos. Derek Boswell, coach for Bartow High School’s fishing team, agrees practicing is important if you want to fish better. “Go out there and cast and get a line wet and enjoy the experience,” he suggests, adding people should wear sunscreen and cover themselves to protect their skin from the sun. Part of the preparation process is familiarizing yourself with the body of water, whether it’s a clear lake or muddy one, he says. It also involves picking the type of line. If you want to learn how to fish, Boswell recommends starting in your own neighborhood lakes and ponds. He also points out there are only about two sports you can play for most of your life: golf and fishing. “You can fish till you’re 90+ years old,” he adds. Through the Bobby Lane Cup, a high school tournament, he and professional bass fisherman Bobby Lane are developing the love of fishing in youths and children as young as 2 and 3 years old. The youngest ones learn to cast from the bank. With this year’s scholarship awards, they’ll total some $40,000. Among the recipients are Stafford, and Boswell’s children, Michael and Kaitlyn. The love of fishing may be instilled in youth. Stafford and Boswell both learned from their dads. Wieber learned from an uncle, the late Gregory Koch. “I really decided to take it to the next step in memory of him,” says Wieber, who was fishing in tournaments since he was 14. Wieber likes to drive around the water beforehand and scope out locations with grasses similar to where he’s used to fishing. Because the fish tend to travel together by size, it’s important to find the schools with larger fish sizes. That’s because the tournaments typically let you keep the five fish that weigh the most, Stafford says. Wieber usually takes around 14 rods, ranging in length from 6 feet, 6 inches to 8 feet. Some are extremely stiff, others extra heavy. Flimsy rods are more sensitive, enabling the angler to detect things like rocks on the lake floor. “The rod is a huge tool in your success,” he says. Fish are attracted to the rattling noise. Fish in the smaller lakes may all be feeding and resting at the same time; a bigger lake provides more opportunities. “It offers a little more variety for the angler,” he explains.